You can still save a huge 50 per cent on food at Anfield's Boot Room Sports Cafe throughout January. Enjoy a range of warming dishes including homemade lasagne made with slow-cooked mince beef, traditional beer-battered fish and chunky chips or our popular Scouse, served with pickled red cabbage, beetroot and crusty bread. Other favourites to choose from include a selection of pizzas and burgers, and there’s also a choice of fresh salads available. 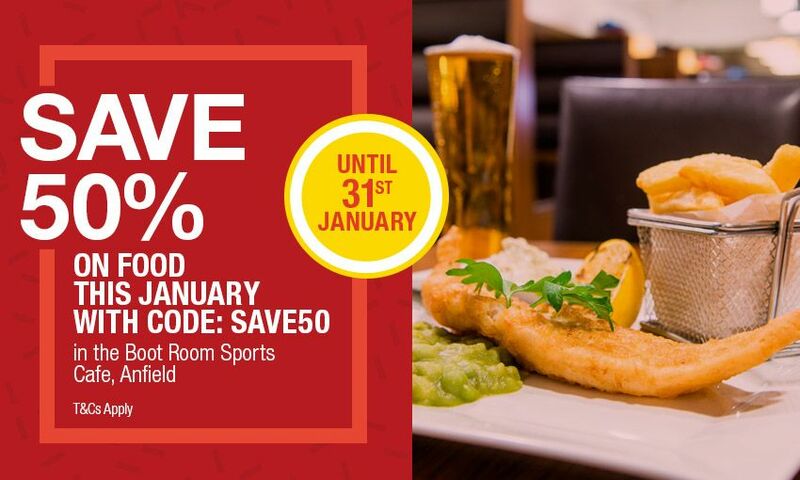 To save 50 per cent off food in the Boot Room Sports Cafe, quote 'SAVE50' when you book your table online or call 0151 906 1892 to make a reservation. This offer is available until Wednesday January 31, 2018. Exclusions apply. For full terms and conditions, click here.